LUNCH FOR SEAN ! 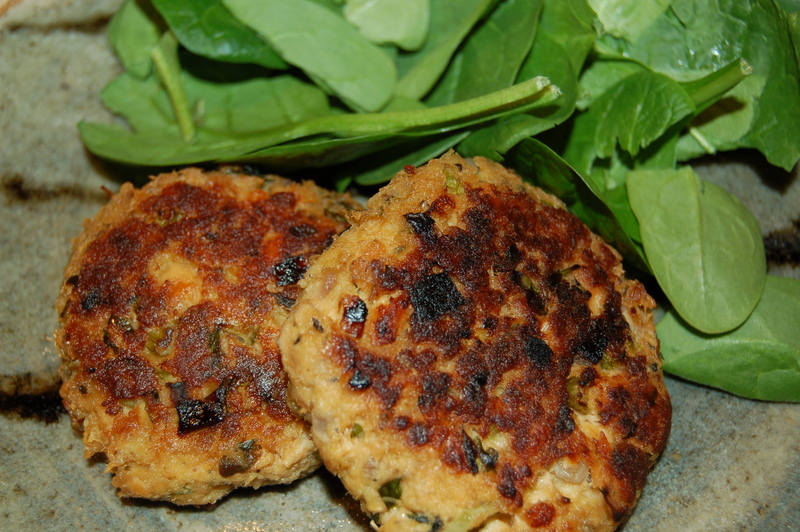 Quick & Easy Salmon Cakes with Rice or Greens (makes 6 cakes – serves 4-6) AND RACING IN MOAB, UTAH | Crappy Kitchen - Good Dinners! ← Thai Salmon Curry (serves 4-6) Super Delicious, Super Fast! 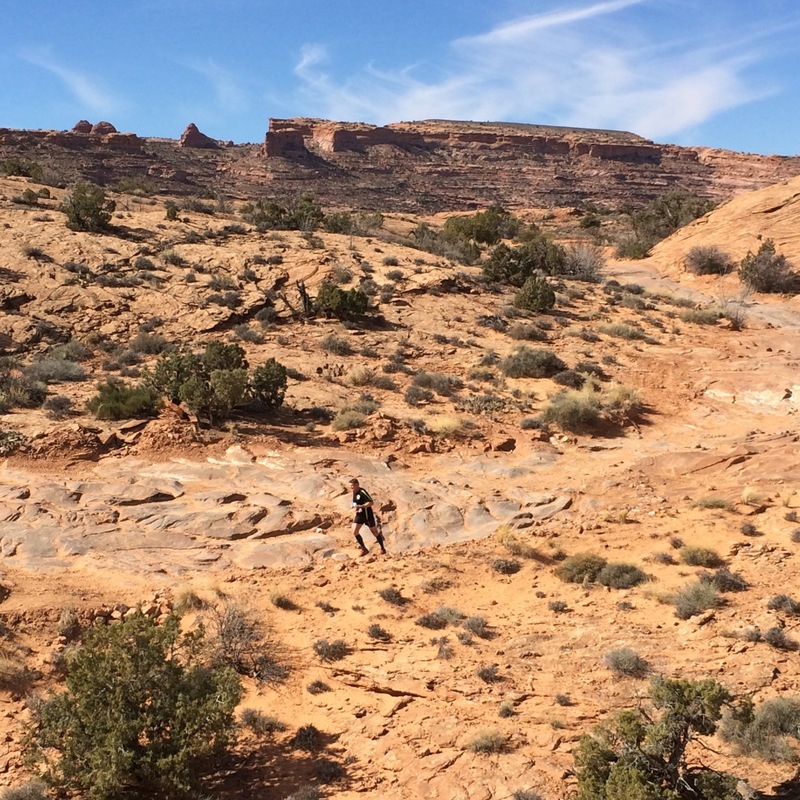 My brother Seán ran his first race of the season this past Saturday: the 33k Red Hot in breathtaking Moab, Utah. Every year I am so jealous of him getting to run in what he describes as one of the most breathtaking trail course races in the United States that I vow I will run with him some day. Alas I didn’t make it again this year!!! I did the next best thing and spoke with him right before the race and then started a 7-mile run at the same time the gun went off in Utah. I picked a route we had run together when he last visited Pennsylvania so he could really visualize where I was and feel more connected. My brother is an Ultra Runner, one of those mad human beings that push themselves to the max in grueling long distance races (anything over official marathon distance of 26.2 miles is deemed an ultra race) making this event last Saturday a mere sprint, being only 19 miles! Yes, he will disagree with that as he takes all his races seriously, but I have witnessed him run 100 miles so you can see my point! – (Read that story here). I suppose it is all relative and Saturday morning I tackled what I considered a respectable distance of 7 miles, and being that it was only 19 degrees in Snowy Pennsylvania, it felt like an Ultra to me. This race is important to him because it is the race that got him hooked on long distance trail running and because it was the last race his friend Jenna was a part of six years ago. Jenna was a talented athlete and one of his biggest champions. She inspired him to believe in his ability to go the distance. 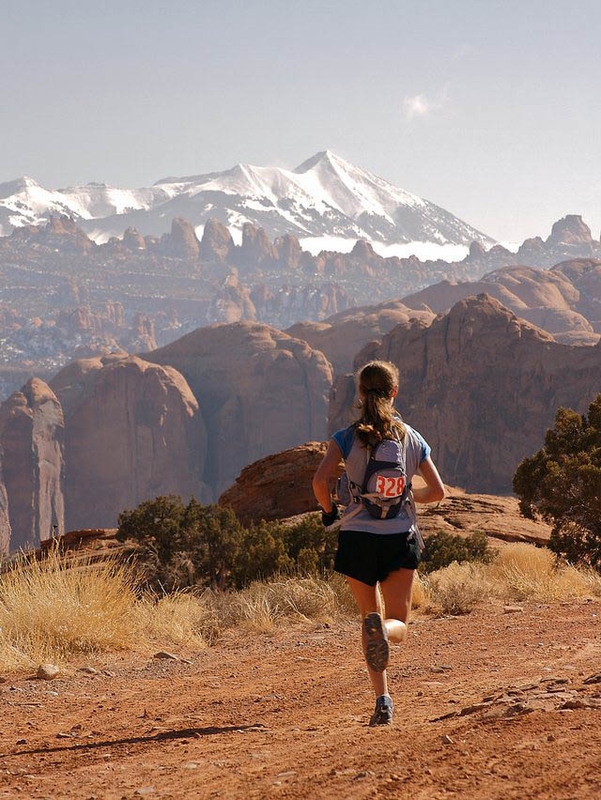 Sadly Jenna is no longer with us in body but she is most certainly out there on the trail with Seán in spirit, and no where is that truer than when he is running on the red ground of Moab. He ran his tough 19 miles on Saturday and as he analyzed his performance afterwards said, “I was as ready as I could have been”. He has run in many races at this point and his ritual is the same: he trains, builds himself up and sets goals, then he rallies everyone he loves around him because this is something he cannot mentally do alone. He brings us along in his head for company and when the going gets tough we are there to cheer him on. I know I was with him step for step as I made it up a few hills myself last Saturday and just thinking about him as I ran along made my snowy and bitterly cold run something I will remember. Kristi standing precariously by the precipice of a canyon! After the race Sean and some friends took an exploratory jaunt to the back country – another reason for me to go to Moab next year! As for this recipe…Seán is always asking me for cooking ideas, especially something easy and good for lunch. And, since I love food as much as he loves 50-mile races, I was only too happy to come up with this salmon dish for him. It is dead simply to prepare, packed with protein and low in calories – a very good combination for any aspiring athlete. This is made with canned Salmon and don’t knock it until you try it. I did a lot of research on canned Salmon and there are plenty of companies out there making quality products. It is super affordable and a life saver pantry ingredient. If you have no plans for dinner or lunch and you want something delicious in a hurry, then this is a recipe you will fall in love with. I made this recipe with optional variations. You can go Asian or more Italian depending on what you have available and on your mood. 1 – Put pan on medium heat and fry the celery and onion for about 5 minutes, stirring frequently. 2 – In a large bowl add the salmon (making sure to remove the skin and bones first) and roughly mash and break it up using a fork. Add the parsley (or cilantro), capers or olives (if using), Old Bay, Worcestershire sauce, mustard, egg and panko. Mix together with a fork and then add the celery and onions and mix everything together with a wooden spoon. 3 – Form the mixture into 12 cakes using your hands and place on a plate until ready to fry. 4 – Put pan or skillet on medium/high heat and when the pan has warmed up, add 1 tablespoon of olive oil. Add 4 to 6 cakes to the pan and fry for about 4 minutes on either sides until browned on outside and heated through. Place on plate and keep warm in oven (180*) while you fry the rest of the cakes (adding more oil as needed). I served these with a very simple savory Basmati Rice and some fresh spinach leaves but you can use anything you like. You can even put these atop a leafy salad or make them the star of a hearty sandwich. The rice I made had some sautéed red onion and celery which highlighted some of the ingredients in the Salmon cakes. Cook the rice and then add your cooked veggies. This entry was posted in dinners and tagged 33k red hot, 33k red hot 2015, 33k red hot moab, blood type A, Blood Type A diet, blood type A dinner, blood type A recipe, capers, chicken, easy dinner, fish cakes, fish dinner, great lunch, moab, moab utah, running, salmon, salmon cakes, salmon dinner, trail running, ultra race, ultra-running. Bookmark the permalink. Nice T, It’s nice to look back and especially nice when you write about racing and food. This will be a staple! I want to run Moab too! Let’s go. let’s do it Brent 2016! and so easy to make right!